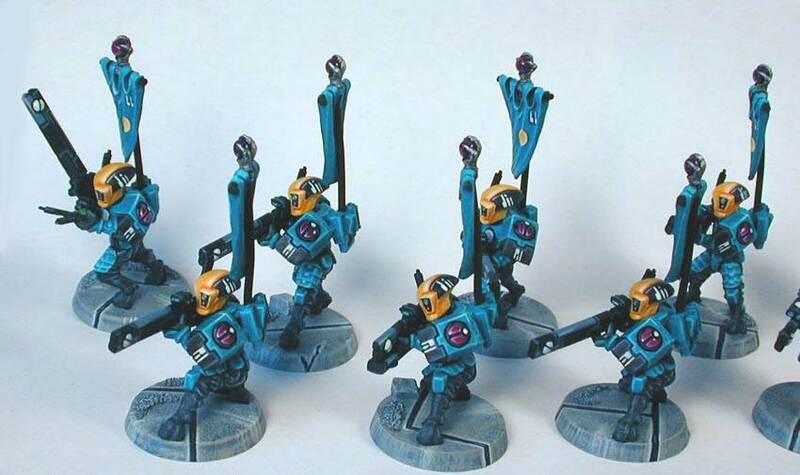 I was asked by David to do a bit of a column on the Tau. While I am no expert on this cool new race, I have just spent the past month painting a 1700 point army for a local Rogue Trader Tournament. I am very busy at the moment with all manor of painting projects and columns really eat into my free time. So, at first I wasn't so sure I would have the time to write about the Tau, then I injured the pointer finger of my painting hand. Why the Tau? Why another army? I have found myself asking these questions over the past month as I have feverishly painted this amazing new force. I swore after I sold my Tyranids that I was not going to do any more armies for myself. Then I got so busy painting contracts and doing Golden Demon projects that I didn't even have time to play. So it looked like I was not going to do another army, at least until I saw the Tau figures, some eight months prior to release. I was instantly enchanted by the high tech look and the manga feel. 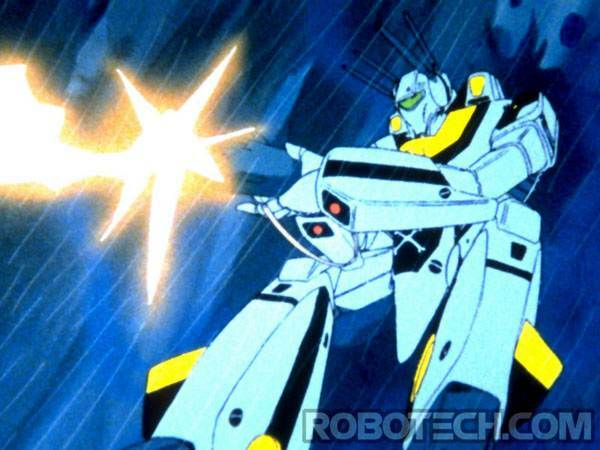 I grew up watching Robotech Saturday morning and I still enjoy watching all kinds of manga. This, I feel, is what set the stage for my instant attraction to the Tau. Lots of big guns blazing away with the twisting interwoven trails of missiles streaking towards the enemy. I originally became interested in 40K because of it's gothic feel. I started out playing Blood Angels, and still maintain a 7,000pt force, because of their blood lust and the gothic tie in to vampires. I appreciated the irony of vampires protecting humans and so I adopted a very heavy gothic history for my Blood Angels. 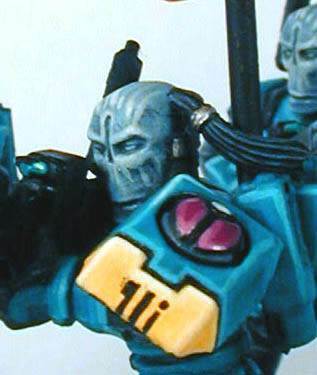 So, it might seem odd that the Tau, a race devoid of any gothic feel, interested me so much. Having delved deep into the gothic aspect of 40K it was a nice break to contemplate an army with an absolutely different character. The Tau seemingly are the only good race in the 40K game. They have become what the Eldar were in 2nd ed., a race that is not outwardly aggressive and without a propensity for violence. So, it was the manga feel, the lack of a gothic character and the projected feeling of goodness that made me pick the Tau as my new army. The main reason I was even contemplating a new army in the first place is I do not have a force that reflects my current level of painting. My Blood Angels are extensive but they are not what anyone would call a display army. So not only did I like the character of the Tau but from what I saw I was going to enjoy painting them. I thought long and hard about how I was going to paint the army. And while I appreciate the look and paint scheme the studio chose for their army I do not think cammo/earth tones are in character for a manga army. 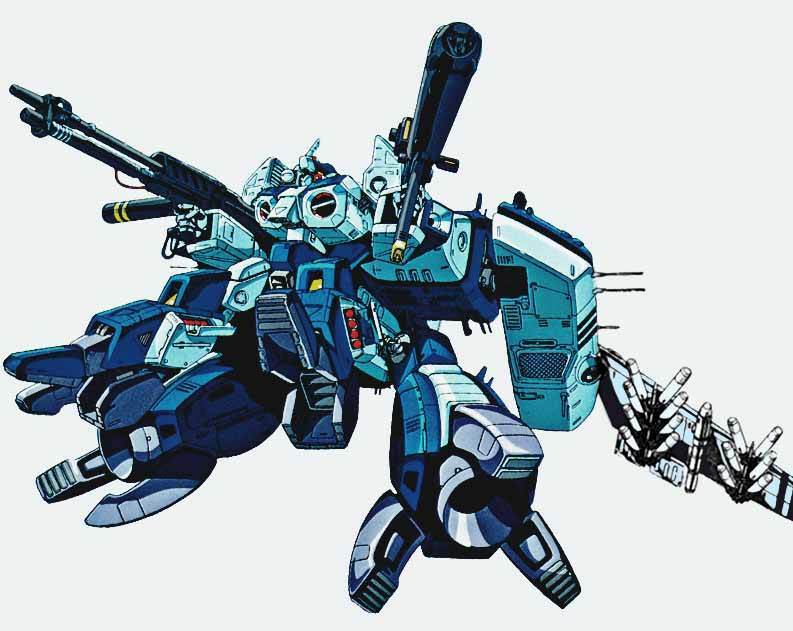 I thought briefly about white armour for the Macross and Gundam look but I am not a big fan of painting white especially on so many figures and to the technical degree I foresaw. 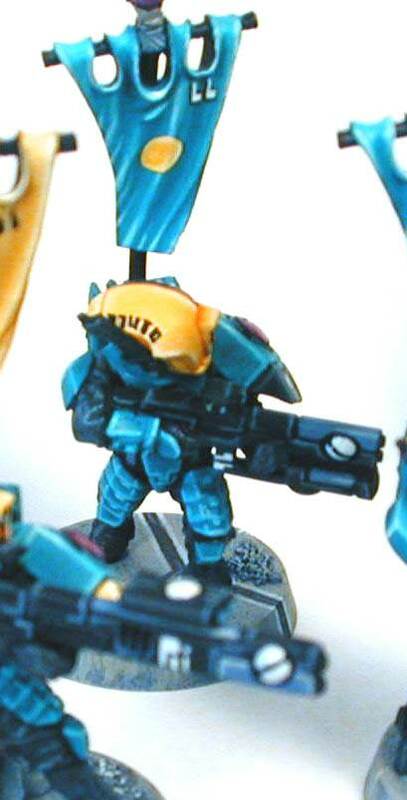 So I went with a dark teal armour with a yellow/black split on the helmet and black guns. The look is totally in contrast to the 'industrial' look of the codex Tau but hey, I like to be different. I have been told that they look too Eldarish and while I appreciate the similarity I see the extensive use of sept markings as a major factor in their non-Eldar look. Also, most Eldar are not two toned as most Tau will be since Eldar mesh armour is a one piece suit unlike the armour of the Fire Warrior. Before I even had my army I was scheming on how I could make it even more unique and decided to do painted concrete style bases and back banners for all the fire warriors. I really like the period of feudal Japan and see the Tau empire in very much the same light as dynastic Japan. So, the idea came from the banners worn by soldiers that displayed the markings of their lord proudly for all to see. 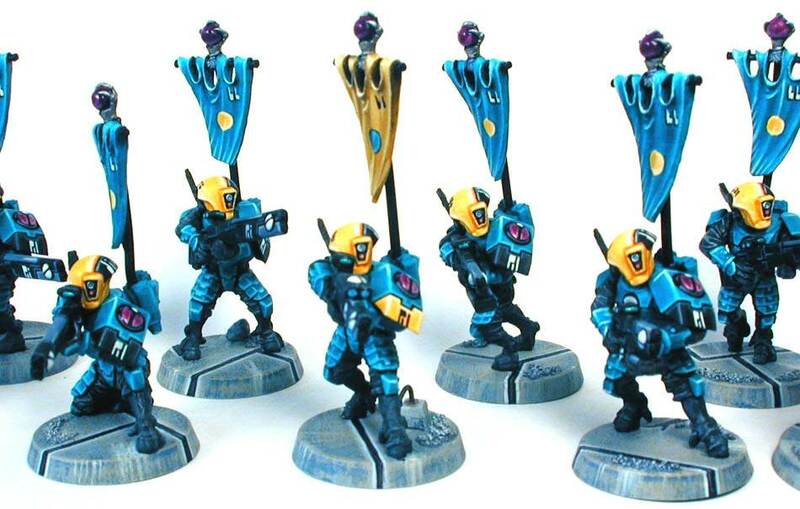 In the case of my Tau the banners depict the unit designation allowing me quickly see who belongs to what unit. I have also painted the banner of the Shas'ui [veteran] a different colour from the Shas'la [soldiers] for quick ID on the table. The banners are from the Dark Elf Corsair standard bearer. I cut the bottom 1/3 off, filed it down, drilled a hole into the sphere and hand at the top and inserted a piece of bailing wire [my heavy pinning wire] into the hole to make the banner pole. I then drilled a hole into the back pack unit of the Tau armour for them to be placed once the Fire Warriors were finished. I inserted the banners into strips of 3mm plastic card [5 per strip] and painted them in bulk. So now that I have set the stage for why I did the Tau and what I did to personalize them I will break into how I painted them. a thin line, adjacent to the black line with SW Grey. Lastly I highlight the edge/rim of each line with white. I primed all the figures black after fully assembling all the model. Well, actually all the model except the head, which I primed white. The heads were cleaned while still attached to the sprue and even painted while the neck section was still attached to the plastic of the sprue. This was a great feature of the Fire Warrior sprue that is just too cool to be an accident. The reason I primed them white is it would make doing the yellow much easier and quicker. 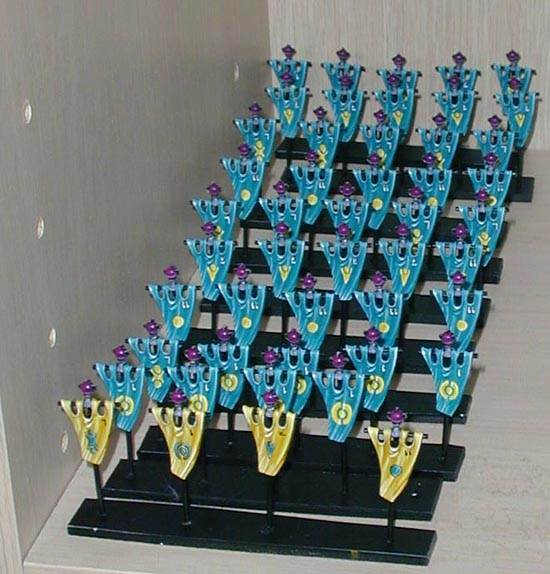 I then endevoured to paint all 36 warriors at the same time. This allows for maximum consistency and greatly increase the speed of army painting. Your mind goes into neutral and it turns into a funny automatic process. The same brush strokes 36 times over and over...I will be able to do exactly the same process in the future because it is burned into my mind. This method is mentally taxing since you do not perceive any real progress until you are almost done the entire figure. I started by painting 2 coats of thinned white paint onto the helmets. This just covers any areas the primer didn't hit or didn't hit heavy enough to eliminate the ghosting of the plastic. I then gave each head 2 coats of Sunburst Yellow. After the yellow I did the black of the neck, center optic array and the left side armour panel. After the black I decided to do a single line shadow of the yellow. I have found that Leprous Brown [one of my favorite multi-purpose colours] makes a fantastic shadow for yellow. So I did 2 coats of diluted line shadows to the armour seams of the head and around the center optic array. From here I highlighted the black with a line highlight at the top most ridge of the black panel where it joined with the yellow. The first highlight was a 50/50 mix of Shadow Grey and Black. This is a pre-made blend that I utilized for many aspects of this army. This highlight was down the entire length of the helmet and about 1/3 around the bottom edge. The next highlight was 100% Shadow Grey that ran about ½ way down the length of the top ridge. The last highlight was Deck Tan [Vellejo] diluted 50/50 with water and Future Floor polish. This colour, when diluted appropriately works as an amazing final highlight for almost any colour. The reason for the floor polish is that it acts as an extender allowing smoother line applications and better brush loading. Since the bottom of each Shas'la main shoulder armour was black I did the highlighting if those areas now as well. While I was doing these highlights I was also doing the cloth portion of the neck. I based it in the 50/50 mix of Shadow Grey and black and then carefully drybrushed it with Shadow Grey and finally a light drybrush with Fortress Grey. This is also how I did the rest of the cloth on the fire warriors legs and arms. While I had the Shadow Grey out I also added some highlights into the black of the optic array. With the black done I moved onto the yellow. I did a broad highlight with 80/20 Sunburst Yellow and White then tighter and tighter highlights towards the edges of the yellow portions of the helmet. These highlights had more and more white until I ended with pure white on the ridge above the optic array, parallel to the black highlight on the top ridge and on the sharp angle at the far right of the helmet. This was repeated for the lower portion of the Shas'ui shoulder. With the highlights finished I moved onto the optic array. For the top optic I painted it Hideous Blue and then did a bottom rim highlight with white. I then painted the circle around the optic with Chainmail and highlighted this with a bottom rim highlight of Mithril. For the bottom optic I chose red. So, first I added two layers of white to the optic so the red would be vibrant when applied. I then painted 2 coats of Blood Red to the optic and ended with a dilute bottom rim highlight of Bad Moon Yellow. Now it was onto the markings on the helmets. I did the call-sign names on the yellow just above where the communication array would go [it was not attached yet but had been primed black] in Tau characters. I used a 10/0 liner with medium/long bristles for this time consuming task. Once this was done I attached the comm array. The main reason for doing this now was so my fingers would have something to pivot on when I did the sept markings on the black portion of the helmet. There is nothing worse than spending lots of time doing yellows to have it wrecked by finger smudges. With the comm array attached I did the sept/unit markings with 3-4 coats of white per line. I had wanted some degree of character among my Fire Warriors so I did up a 12 Tau squad of helmetless warriors. 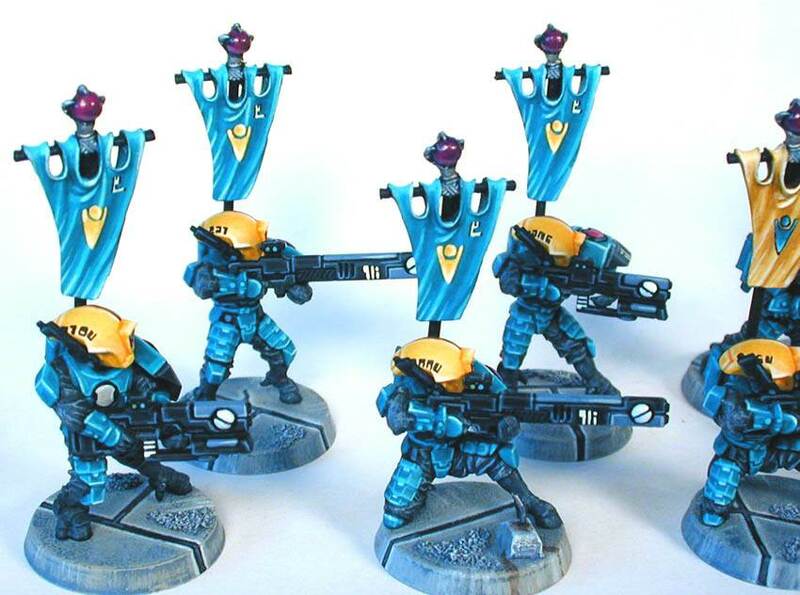 My idea here was to have a squad that would defend the Ethereal and since the Aun [Ethereal] have bare heads I figured why not do that with the Fire Warriors as well. I think it turned out pretty well. I painted the heads pretty much like they did in the codex. I based them in Shadow Grey then did about 3 successive highlights by adding Hideous Blue to the Shadow Grey. I then did a drybrush with straight Hideous Blue and successive highlights by adding Bleached Bone into the blue. With the last of these highlights I did some line texture on the scalp and large plain below the eyes. Lastly I did some minor highlights with pure white for more contrast. Now that the heads were finished I moved onto the body suits of the warriors. They were done in the same way I did the neck of the head portion. This drybrushing, while not technically spectacular, is very effective for showing up the texture of fabric and saved me valuable time. With the suits done it was time to move onto the armour plates of the fire warriors. I chose to base it in Hawk Turquoise, and while it did take 3-4 coats of diluted paint to cover the areas to my satisfaction I knew it was time well spent. After the base coat was down I did a broad highlight in 80/20 Hawk Turquoise [HT]/Bleached bone [BB]. After this I did a much tighter highlight on every single armour ridge with 50/50 HT/BB then an even tighter highlight with 30/70 HT/BB. I ended with pure white diluted with 50/50 water/Future Floor polish to the top or bottom ridge of the main shoulder plate, the leading edge of the smaller shoulder plate, the top of each knee armour, the top of the right hand guard and the notched portions of the thigh armour. This allowed me to give the impression of blending when in truth it was nothing more than extensive outlining. It took me 15 minute per fire warrior to do each of the middle two highlights but the savings in terms of time over blending was major. The next major thing to do was the symbol on the shoulder pad. I decided on Warlock Purple which gives a nice deep reddish purple when applied over black. It took 3-4 coats to cover the black since the pigment is very translucent. Once this was done I highlighted the inset rim with Shadow Grey. While it is hard to see it frames the purple better than a void of black. I highlighted the symbol with 70/30 Warlock Purple [WP]/Bleached Bone [BB]. This initial highlight was done around the edge of the entire symbol except the top, which I left open. The next two highlights focused more and more towards the bottom of the symbol. They were, 50/50 WP/BB and 30/70 WP/BB. This process was also repeated on the orb at the top of the banner poles used for the Fire Warriors. The last major area of the warrior was his gun. I did a pretty major outline with the 50/50 Black/Shadow Grey. This gives increased contrast between the grooves and the gun body. I then did selective highlights with Shadow Grey. On some parts of the gun I did Shadow Grey as a base coat to break up the solid black of the gun. This was highlighted with Deck Tan diluted with 50/50 Floor polish and water. I did the half spheres in white to provide even more visual stimulus on the gun. This took 3-4 coats for the white to completely cover the black. The scope optic was based in Jade Green and then highlighted with 2 shades of Jade mixed with White. I used white here, instead of the usual Bleached bone, because I wanted a harsh highlight. The two buttons on the side of the rifle scope were done in Hideous Blue and Goblin Green. They were each highlighted twice with successively more Bleached bone. With the guns finished I added white sept/unit markings on the guns as well as the black portion of the large shoulder plate. These touches really make the units look complete and individualized. All that I had left to do was the center chest plate. This was kind of tricky since I had already glued the gun into place. However, I was able to do all the circles with 3 coats of Fortress Grey and two highlights with white without marking on the gin or surrounding armour even once.. This comes from really knowing what your brush is able to do and what angles are best to approach something from. Once I was finished the painting I sprayed them with GW spray. This spray is too gloss for my taste so I then spray the models with Testors Dulcoat forcing it to dry with a blow dryer. This gives a nice not flat and not gloss finish. After the varnish process I did some selective gloss varnish. I glossed the purple orb at the top of the banner, the optics of the head, the buttons and optic of the scope, the symbol of the shoulder and the white half orbs at the end of the guns. 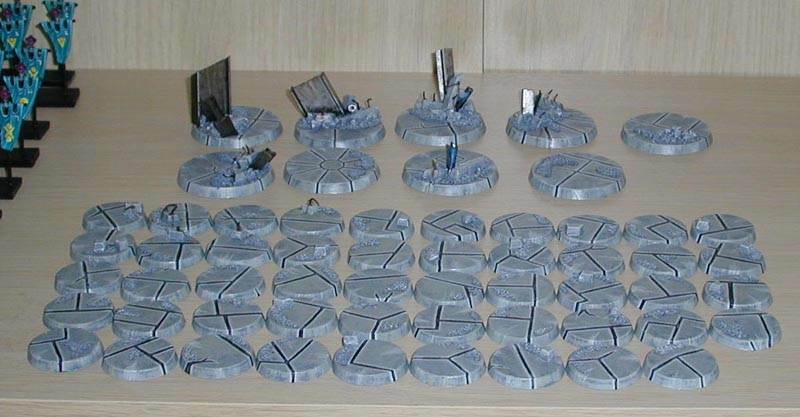 this doesn't get you excited about painting Tau, I don't know what will. links section for your future reference.